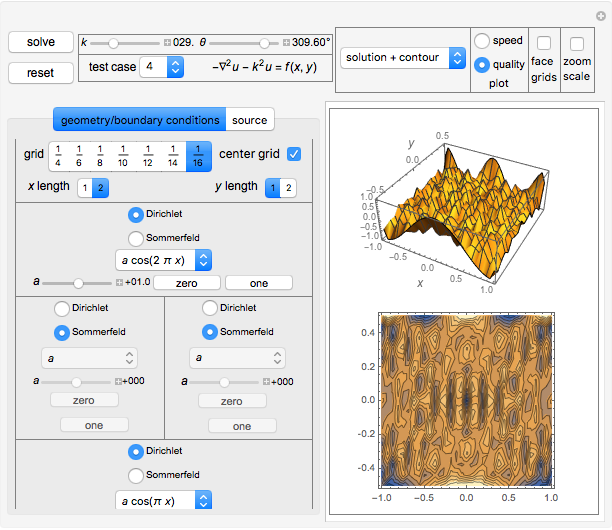 This Demonstration implements a recently published algorithm for an improved finite difference scheme for solving the Helmholtz partial differential equation on a rectangle with uniform grid spacing. 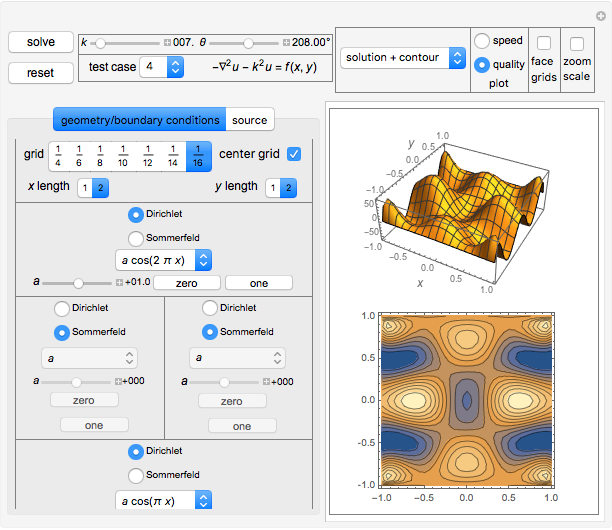 Dirichlet and Sommerfeld boundary conditions are supported. You can specify different source functions . 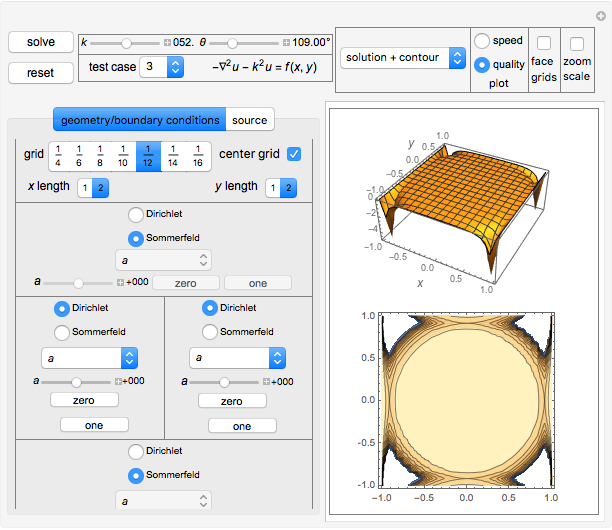 You can prescribe Sommerfeld boundary conditions on up to three edges of the rectangle at the same time. You can vary the value and the angle of incidence . The numerical scheme is converted to a standard system of linear equations system, which can then be solved. You can view the generated matrix and its eigenvalues as well as the solution data using the dropdown menu in the top row. Details of the algorithm are described in . This implementation converts the finite difference scheme to the standard form and uses the built-in Mathematica function LinearSolve to obtain the solution. Sparse matrices are used. 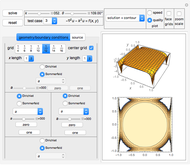 The matrix and its eigenvalues and the numerical solution can be viewed using the dropdown menu. The discretized scheme is given by where and . Click the "solve" button after making changes to the UI variables to get a new solution. The "reset" button is used to initialize the system back to the state it was before the "solve" button was clicked. Different types of plots and options are available to choose from. Y. S. Wong and G. Li, "Exact Finite Difference Schemes for Solving Helmholtz Equation at Any Wavenumber," International Journal of Numerical Analysis and Modeling, Series B, Computing and Information, 2(1), 2010 pp. 91–108. Nasser M. Abbasi "Solving the 2D Helmholtz Partial Differential Equation Using Finite Differences"